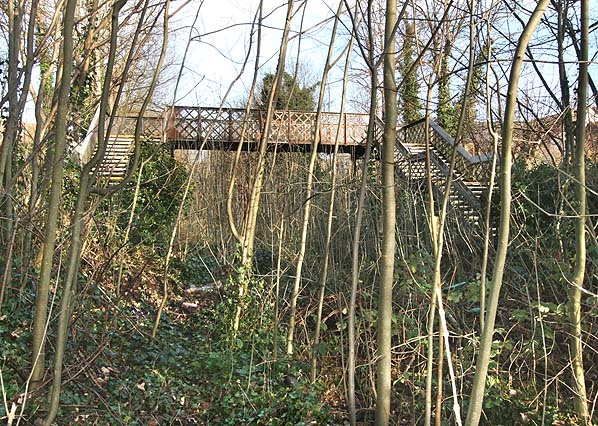 Present state: Demolished - no evidence of the station remains although the original footbridge is still in use. Notes: On 1st July 1906 a new halt was opened between Coombe Lane and Selsdon in an attempt to attract more passengers to the Selsdon Line. Spencer Road Halt had two 100 foot timber platforms made our old sleepers but no buildings, just a wooden name board and a row of posts for holding oil lamps in winter. A lattice footbridge linked the platforms and also formed part of a footpath between Spencer Road and Birdhurst Rise. The railway company hoped that this halt would enable passengers to change to the Brighton Line by taking the ten-minute walk to South Croydon station - very few did. Although the halt was surrounded by substantial late Victorian villas it could only be reached by footpaths and was short lived, closing on 15th March 1915 as an economy measure during WW1 and it did not reopen after the war. 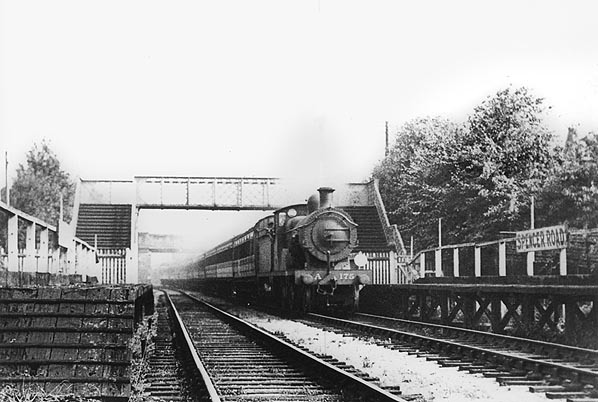 The halt remained intact for 20 years but was demolished in 1935 when the line was electrified. The Woodside & South Croydon Railway was authorised in 1880 to build a 2 mile 28 chain link from the South Eastern Railway's Mid Kent line at Woodside to a junction with the the Croydon & Oxted Joint (LBSCR & SER) line which opened on the 10th March 1884. The Woodside & South Croydon Railway opened on 19th August 1885 with an intermediate station at Coombe Lane and a junction station with the Oxted line at Selsdon Road. The main engineering feature on the line were three contiguous tunnels under the Addington Hills, Woodside (266 yards), Park Hill (122 yards) and Coombe Lane (157 yards). Rolling stock was supplied by the South Eastern Railway who ran the service until the London Brighton & South Coast Railway took over at the beginning of 1887. The line had a chequered career from the offset; the first proposal to close came in 1895. With increasing competition from trams and busses in the early 1900's Kitson Railmotors were introduced to try and improve passenger numbers. At the same time two new halts were opened, Spencer Road Halt between Selsdon Road and Coombe Lane and Bingham Road Halt between Coombe Lane and Woodside. Both were very basic built of old sleepers with no buildings. Bingham Road was sited close to the tram terminus in Lower Addiscombe Road and was well used. Although passenger numbers improved it was not enough and with losses running at over £2000 a year the passenger service was withdrawn as a wartime economy measure in 1915 when the Railmotor service was withdrawn. Coombe Lane and Selsdon Road remained open for some through trains until 1916 but the new halts were closed. Oxted line as far as Sanderstead to allow trains to reverse. Coombe Lane was rebuilt and renamed Coombe Road and Bingham Road Halt was rebuilt as a station. Initially it was going to be renamed Ashburton but on opening it retained its original name of Bingham Road. 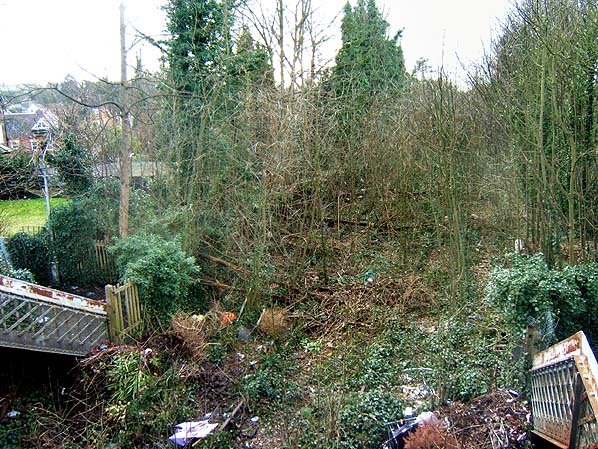 Selsdon Road was renamed Selsdon while Spencer Road Halt was not reinstated and the remains of the station were cleared away. The new electric service started on 30th September 1935. The early enthusiasm was however short lived with disappointing passenger numbers bring a reduction of the service during WW2 with still further reductions after the war when off peak trains terminated at Elmers End. With no improvement during the 1950's closure was announced for 4th March 1963. A local pressure group was formed to fight the closure claiming there was no alternative and after several public meetings the Ministry of Transport rejected the closure plans because of the hardship it would cause to the 650 daily passengers using the line. With no improvements the Saturday service was withdrawn in January 1967 and in 1976 all through trains to London were withdrawn reducing the line to a shuttle service between Sanderstead and Elmers End, seven years later the line finally closed on 13th May 1983. 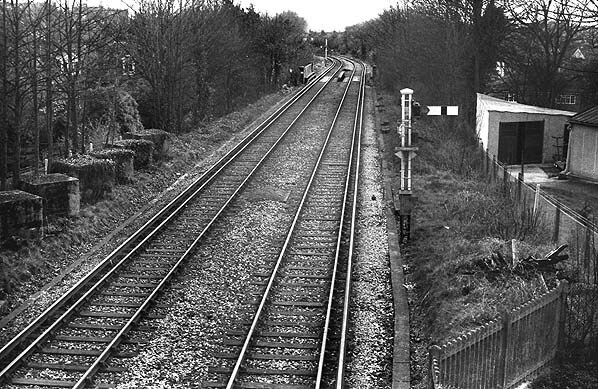 The track was lifted during the summer of 1984 and by the autumn of that year Bingham Road and Coombe Road stations had been demolished. 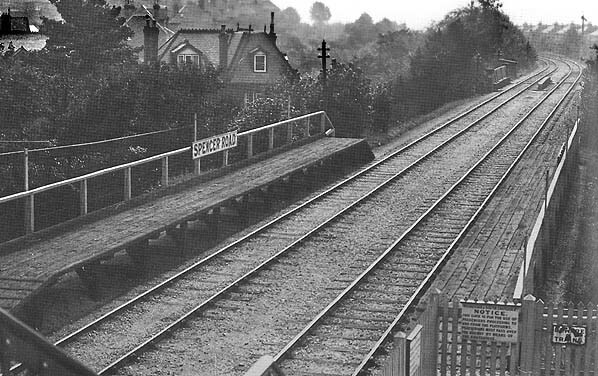 A short section of track between Selsdon and the footbridge at Spencer Road was retained to serve the Selsdon Oil Siding. 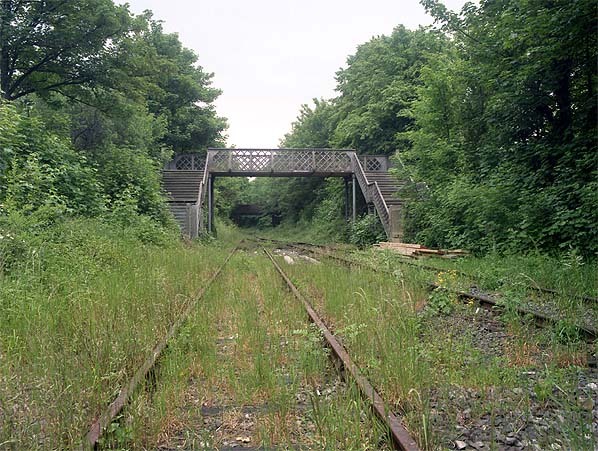 This finally closed in 1993 and although heavily overgrown the track is still in situ as is the down platform at Selsdon. The junction has however now been lifted making retrieval of the remaining track very difficult. In 1986 a study of Greater London transport was undertaken by London Transport and British Rail, one of its proposals was the reintroduction of trams in the Croydon area to ease traffic congestion and to provide a service into New Addington which was poorly served by pubic transport. In 1990 Croydon Council and London Transport began working together to promote the Tramlink project which received considerable public support. working together to promote the Tramlink project which received considerable public support. In November 1991 the Croydon Tramlink Bill was submitted to Parliament and received Royal Assent on 21 July 1994, allowing London Regional Transport to authorise the construction of Tramlink. Three routes were to be built, Croydon - Beckenham Junction, Croydon - new Addington and Wimbledon - Elmers End. As the lines from New Addington, Beckenham and Elmers End converged on Croydon (click here for map) they would utilise almost the entire length of the former Elmers End to Selsdon railway line with the three lines joining at a new junction at Sandilands from where they would run into central Croydon. The first Tramlink route to New Addington opened on 10th May 2000 with the line to Beckenham through Addiscombe following on 23rd May. For a full history and photographs of the Woodside and South Croydon Railway see the Transport of Delight web site. Click here for a photo gallery. 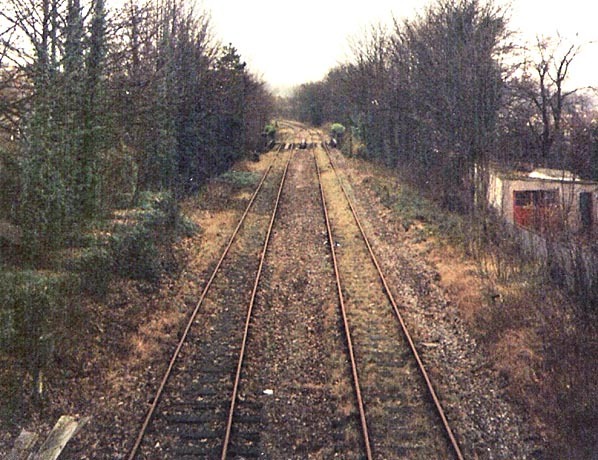 The site of Spencer Road Halt looking south in 1980. Note the WW2 anti-tank blocks on the left.